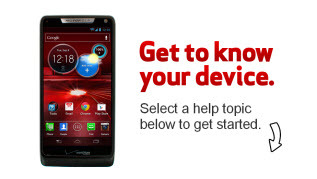 Find device-specific support and online tools for your DROID RAZR M by MOTOROLA. Here's how to transfer picture or video files between your RAZR M / LUGE and your computer. To wirelessly transfer data from your DROID RAZR M / LUGE to another NFC-capable device, view this info. Here's how to view signal strength on the DROID RAZR M / LUGE. Discover how to find mroe help on your Droid Razr M Smartphone. View this info if your DROID RAZR M / LUGE is unresponsive, frozen or won't power on or off. Here's how to improve the battery life of your DROID RAZR M / Luge. Here's info on the battery specs (e.g., Talk Time, Standby Time, etc.) for your RAZR M.
To make your DROID RAZR M / LUGE visible to Bluetooth devices, view this info. Here's how to send unwanted calls directly to voicemail for your RAZR M / LUGE. To view or clear the call history on your DROID RAZR M / LUGE, check out this info. Learn how to return to a call on your DROID RAZR M Smartphone. Explore how to place a call to a contact using your Droid Razr M.
Learn how to use your Droid Razr M to call a new number. Learn how to switch between calls on your Droid Razr M Smartphone. Here's info on common camera settings (e.g., flash, timer, panorama, etc.) for your RAZR M / LUGE. Discover how to change from the rear to the front-facing camera while taking a picture with your Droid Razr. Learn how to share pictures using your Droid Razr. Discover how to zoom in and out using your Droid Razr. If you can't transfer media between your DROID RAZR M / LUGE and PC, view this info. To turn the mobile data for your DROID RAZR M by MOTOROLA / Luge™ by Motorola on or off, follow these steps. To modify data usage options for the personal email account on your DROID RAZR M / LUGE, view this info. If your DROID RAZR M / LUGE shows the incorrect date and/or time, view this info to correct it. Discover how to access settingson your DROID RAZR M by MOTOROLA Smartphone. Explore how to change the ringtone on your Droid Razr M Smartphone. A walkthrough for setting screen security on your DROID RAZR M by MOTOROLA Smartphone. A visual guide for setting your Droid Razr M to silent. If the display on your DROID RAZR M / LUGE doesn't rotate, this shows how to fix it. To update the personal email password/server settings for your DROID RAZR M / LUGE, view this info. Removing then re-adding a Gmail account on your DROID RAZR M / LUGE often fixes email issues. Here's info on personal email settings (e.g., account name, etc.) for your DROID RAZR M / LUGE. If you're not getting notifications for the personal email on your RAZR M / LUGE, view this info. To enter or edit the personal email signature on your DROID RAZR M / LUGE, view this info. Here's how to add a work email account on your RAZR M / LUGE. To adjust the personal email sync frequency settings on your DROID RAZR M / LUGE, view this info. Here's info on updating work email settings for your DROID RAZR M / LUGE. Removing then re-adding a work email account on your DROID RAZR M / LUGE often fixes email issues. Removing then re-adding an email account on your DROID RAZR M / LUGE often fixes email issues. Here's how to view email messages on your DROID RAZR M by MOTOROLA / LUGE. An interactive guide for adding a home screen while using your Droid Razr M.
An interactive guide on how to create a folder on your DROID RAZR M Smartphone. To turn Mobile Hotspot on/off on your DROID RAZR M / LUGE or if you can't connect to Wi-Fi, see this. To change the Mobile Hotspot password on your DROID RAZR M / Luge™ by Motorola, view this info. Here's how to unlock the screen on your DROID RAZR M / LUGE. To disable the screen lock setting on your DROID RAZR M / LUGE, check out this info. Here's how to set up a screen lock (PIN, password, pattern, etc.) for your DROID RAZR M / LUGE. Discover how to use the security features to lock and unlock your Droid Razr M Smartphone. Here's how to set up facial recognition to unlock your DROID RAZR M / LUGE. View this info on memory card formatting options for your RAZR M / LUGE. To view or close recently used apps on your DROID RAZR M / LUGE, view this info. Explore how to clear notifications on your Droid Razr M Smartphone. An interactive map of the most important features of your Droid Razr M Smartphone. To check for or to install software updates on your DROID RAZR M / LUGE, view this. To view the software version your DROID RAZR M by MOTOROLA / Luge™ by Motorola is running, check out this info. Discover how to install a SIM card on your DROID RAZR M by Motorola Smartphone. Learn how to remove a SIM card on your DROID RAZR M by Motorola Smartphone. To utilize the speakerphone functionality on your RAZR M / LUGE, view this info. To receive delivery confirmation for messages sent from your DROID RAZR M by MOTOROLA / Luge by Motorola, view this. A visual guide for ignoring a call and sending a text message on your Droid Razr M Smartphone. To add, remove or edit the text message signature on your DROID RAZR M / LUGE view this info. Here's how to change permissions to allow or block sending premium texts from your RAZR M or LUGE. To change the TTY settings on your DROID RAZR M / LUGE, check out this info. Learn how to change the wallpaper on your DROID RAZR M Smartphone. Here's how to use Wi-Fi Direct so you can easily connect your DROID RAZR M / Luge with other Wi-Fi capable devices. To allow your DROID RAZR M / LUGE to auto switch between Wi-Fi and mobile data, view this. View this info if the Wi-Fi network you want to add to your RAZR M / LUGE doesn't display. To remove a saved Wi-Fi network from your DROID RAZR M by MOTOROLA / Luge by Motorola, view this info.